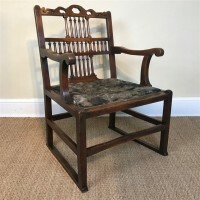 A George 111 style leather and mahogany desk chair circa 1900 in the Hepplewhite manner with the original brass studded leather to the back and sides, The seat and webbing completely re furbished and covered in old leather. 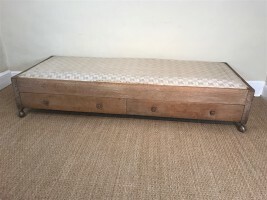 A Heals oak bed circa 1930 freestanding with 2 drawers below . 74 inches long 31 inches deep 15 inches high. 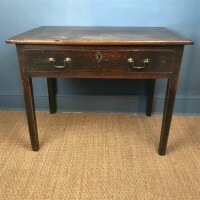 A George 111 cabriole leg dresser Shropshire circa 1780 cross banded on cabriole legs with the original brass swan neck handles. 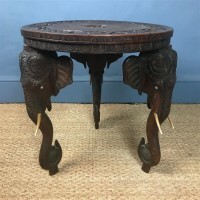 An Indian black wood carved elephant table Bombay circa 1900 with ivory tusks . 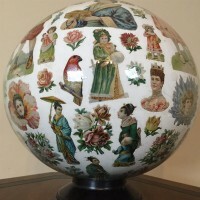 26 inches diameter 28 inches high. 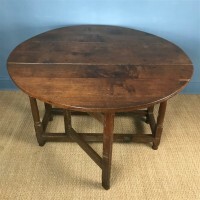 An early 18th c oak gateleg table with oval drop flap top. 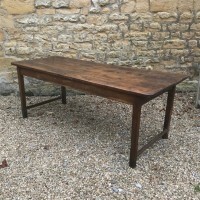 Read more: An early 18th c oak gateleg table with oval drop flap top. 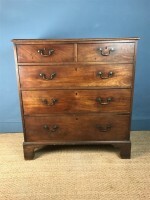 A George 111 mahogany Chest of Drawers circa 1780 with two short and three long graduated drawers with original brass swan neck handles on bracket feet. 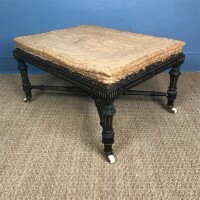 A George 111 oak country side table circa 1800 with a lovely original patina and cleated top above a single frieze drawer with original brass swan neck handles. 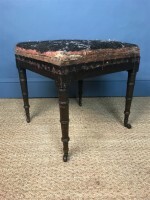 A George 111 mahogany stool circa 1810 in good solid original condition ready for recovering. 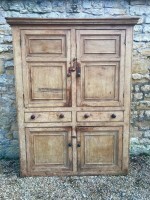 A George 111 pine Housekeepers Cupboard c 1800 West Country. 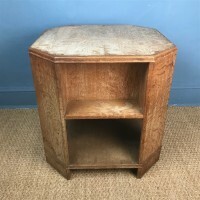 A George 111 pine Housekeepers Cupboard c 1800 West Country dry scraped to the original paint and in great solid condition. 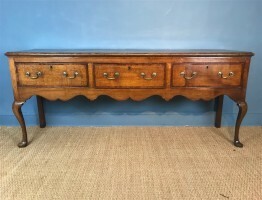 Read more: A George 111 pine Housekeepers Cupboard c 1800 West Country. 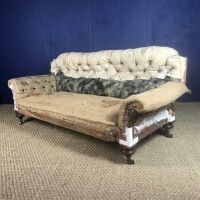 A large Victorian leather library armchair circa 1880 in lovely original condition with a down cushion and a sack to the back. 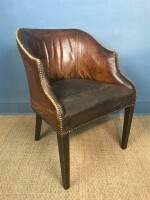 The leather on this deliciously comfortable library chair is in the most lovely soft worn but useable order. 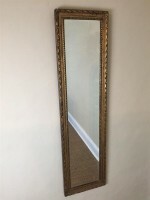 A Regency gilt Pier Mirror circa 1820 with original mercury glass. 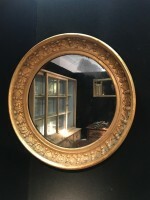 Read more: A Regency gilt Pier Mirror circa 1820 with original mercury glass. 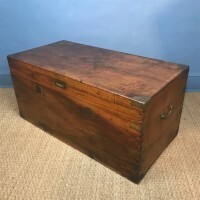 A large 19th c Export Campaign Camphor and brass banded Box circa 1880 perfect for a coffee table or a trunk at the end of a bed. Inscribed in pencil to the lid Biss Glory RMA presumably The Royal Military College Sandhurst. 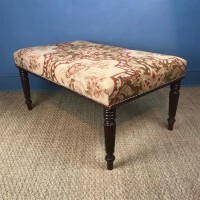 A large Regency mahogany stool circa 1820 with 19th c English needlework top on tapered reeded mahogany legs. 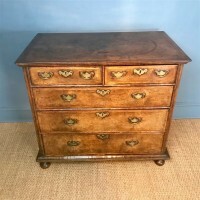 A William and Mary walnut chest of drawers circa 1700 the quarter veneered top with feather banding with two short and three long side hung oak lined drawers. This early chest of drawers has a particularly lovely warm honey coloured patination . The brass handles are mid 18th c replacements. 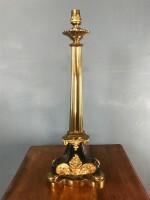 A George IV gilt brass and ebonised lamp circa 1830 by Messenger of London . Read more: A George IV gilt brass and ebonised lamp circa 1830 by Messenger of London .